This is the third of several stories exploring the contentious relationship between the scientific community, which insists animal research is essential to medical progresss, and the animal rights activists working to abolish animal experimentation. Earlier pieces included the effort to shift the debate from sidewalks to courtrooms, and efforts to establish the “personhood” of species like apes and whales. San Diego is an animal rights zealot. He is under federal indictment for allegedly igniting explosive devices outside two Northern California firms – biotechnology giant Chiron and homecare-product manufacturer Shaklee — in 2003. The FBI says a potentially deadly second explosive at Shaklee, strapped with nails and likely targeted at first responders, was defused. FBI assistant director Mike Heimbach calls them acts of terror, possibly meant to take lives, destroy property, and damage companies. The FBI has noted an uptick in violent rhetoric by animal activists and a shifting away from the code of nonviolence toward blatant threats and intimidation. Its website asserts that between 1979 and 2008, the Animal Liberation Front (ALF), the Earth Liberation Front, and other extremist groups have committed more than 2,000 criminal acts and caused $110 million in damages. In a February 2011 Nature magazine poll, nearly a quarter of the animal research scientists who responded reported being affected by or knowing someone affected by animal rights activists. A little more than 15 percent had changed practices or direction as a result. Whether driven by fear or conscience, some large institutions are responding to calls for animal rights — this week, for example, the U.S. Environmental Protection Agency inked a deal with cosmetic maker L’Oreal that they hope brings them closer to one day using a computerized system to forecast a chemical’s safety instead of using live animals. Ultimately, as long as biomedical researchers continue experiments using animals, they’re likely to have their own image problems in the war for hearts and minds. U.S. law and U.S. agencies are both looking at ways to reduce the use of animals in labs. Click the image to read the story. In June 2010, a dead animal was found after being left in a cage being sanitized with water reaching 180 degrees Fahrenheit. The facility said it died before entering the washer. Research is currently suspended at the center, which has more than 1,700 monkeys and has received 19 citations from the USDA for Animal Welfare Act violations in three years. Daniel Andreas San Diego’s gripe with Chiron and Shaklee, authorities believe, was that both companies apparently did business with Huntingdon Life Sciences, one of the world’s largest contract research organizations, with operations in the United Kingdom, United States, and Japan. It provides animal-testing facilities and services to clients in such industries as pharmaceuticals, food, and chemicals. Huntingdon has long aroused the ire of moderates as well as extremists. Since 1989, disturbing undercover footage — from showing a beagle pup being punched in the face to a live monkey being dissected apparently while conscious — has emerged from various undercover investigations. In 2001, a Huntingdon executive in the U.K. was severely beaten by three masked extremists bearing bats. According to a tally at the website Idealist.org, there are 1,626 nonprofit animal-related groups in the U.S. For armchair sympathizers and peaceable activists and protesters alike, the handiwork of the fanatical minority is a liability. In a sense, zealots like Vlasak serve the biomedical research community as useful enemies, handing it compelling justifications for locked laboratory doors and research secrecy. Whether that bunker mentality works is another question: In the U.K., increased transparency has been seen as calming animal rights actions (in tandem with tougher laws and moderates’ revulsion at the worst extremist acts). According to TheEconomist last October, while legal protests against U.K. animal-testing facilities are up, illegal attacks are currently down. Stop Huntingdon Animal Cruelty (SHAC) was founded in Britain in 1999 to try to shut down its namesake’s laboratories. It targeted firms doing business with Huntingdon or with financial ties to the organization; the biotech industry fought back, telling the British government that the U.K. drug industry would boycott those who caved in to SHAC. In May 2004, seven activists were brought up on federal criminal charges for running SHAC’s U.S. website. In hopes of shutting Huntingdon’s New Jersey facility, the website routinely posted news supporting illegal acts like vandalism and releasing animals from laboratories alongside news of legal actions. In 2006, six of the activists received one to six years in prison for crimes centered on encouraging others to harass and intimidate Huntingdon employees. Theirs were the first convictions using 1992’s Animal Enterprise Protection Act, which made stealing from or causing damage or property loss to an “animal enterprise” a criminal activity. In November 2006, the rarely used law was replaced by the Animal Enterprise Terrorism Act, or AETA. At least two heavy-hitting lobbying groups with members in biomedical research and other industries with a financial stake in these issues were instrumental in the passage of the AETA. Marie Claire reported in 2011 that the American Legislative Exchange Council drafted the law working closely with members of Congress and that the group’s members included 2,400 state lawmakers and 80 members of Congress. The National Association for Biomedical Research also rallied behind the AETA, creating the group Animal Enterprise Protection Coalition. Will Potter, a journalist, civil rights and domestic terrorism expert and the author of Green Is the New Red: An Insider&apos;s Account of a Social Movement Under Siege, says the biotech nonprofits lobbied with the support of corporations like Pfizer, Wyeth, Glaxo Smith Kline, The National Cattlemen’s Beef Association, the Fur Farmers, which he identifies as “the driving force on this.” Other groups supporting the AETA ranged from the Pet Food Institute, the American Psychological Association, the American Veal Association, and the American Brain Coalition. Many civil libertarians and First Amendment experts argue it equates protest with terrorism and stifles protected speech and the right to assemble. Potter believes the AETA is part of a larger campaign to demonize all supporters of animal rights, not only the movement’s radicals. Attorney Odette Wilkens is the founder of The Equal Justice Alliance, a coalition of more than 200 social justice and animal protection organizations that, along with the Center for Constitutional Rights, the Civil Liberties Defense Center and others, is working to repeal the AETA. “AETA stands the First Amendment on its head,” she says. “Compared to other groups who are violent and murdered many people on a premeditated basis, such as anti-abortionists and white supremacists, animal activists have been singled out as the No. 1 domestic terrorism threat, even though they have never killed a single person.” She says the AETA criminalizes protected speech. Where to draw a line between protected acts and “interference” is unsettled, and opponents of the law say it creates a chilling effect on the kinds of undercover investigations that historically have been important in uncovering egregious activities in research facilities and livestock operations. Other laws bubbling up at the state level to heighten it include so-called “ag-gag” laws that criminalize gaining access to livestock operations under false or undercover pretenses to document abuses. Iowa’s governor signed the first such law in the nation last week, and Utah looks set to soon have the second. In December, the Center for Constitutional Rights filed a federal lawsuit, Blum v. Holder, in Massachusetts on behalf of five longtime activists who want the AETA struck down as unconstitutional and a violation of the First Amendment. The first indictments under AETA came in March 2009. Four activists were accused of being involved in protests that included a February 2008 demonstration outside a UC Santa Cruz cancer researcher’s home. They allegedly wore masks, shook the researcher’s door, and frightened her two young children before being chased away; the incident was described as an attempted home invasion. One activist allegedly also hit the researcher’s husband with an object in a scuffle. The four, who could have faced 10-year sentences, saw their cases dismissed in July 2010 for being too vague and non-specific. Other UC-related protest incidents include trespassing on a UC Berkeley professor’s front yard and accusing him of being a murderer. And defamatory comments have been chalked on public sidewalks outside researchers’ residences. More serious incidents have taken place. On March 7, 2009, an early-morning blast woke David Jentsch, a UCLA psychologist and neuroscientist conducting schizophrenia, amphetamine, and addiction research on rodents and vervet monkeys. Jentsch’s Volvo had been firebombed. The Animal Liberation Brigade took responsibility. In November 2010, Jentsch received a razor blade-filled package and a note threatening to slash his throat from another extremist group calling itself the Justice Department,. Gruesome images periodically emerge — a primate at Cornell whose lungs essentially burst during a 2009 surgery, baboons that inspectors found at Yale in 2010 with blisters and burns from heating pads, 32 monkeys cooked alive at a Reno, Nevada, facility of when a heater was left on — confirming activists’ worst suspicions that even with the Animal Welfare Act and USDA inspections and regulations, the system can and does fail, riling activists and inciting extremists. Veterinarian Robert Dysko, president of the American Association for Laboratory Animal Science and the associate director of the University of Michigan’s Unit for Laboratory Animal Medicine, is not insensitive to these issues. “I become concerned when I see the abuses,” he admits, “and certainly there has been some footage that has troubled me.” But he cautions against a rush to judgment noting that the lay public may not always realize that animals seen in awkward-looking positions are anesthetized. When Oregon Health and Science University’s P. Michael Conn, recalls his harassment, he says he never heard it mentioned “that my institution is fully accredited and in compliance with all federal and state laws.” The National Primate Research Center there — Conn is its director of the Office of Research Advocacy — is one of eight federally sponsored primate research centers housing almost 4,000 nonhuman primates. In 2002, he told a hearing of the FBI’s Joint Terrorism Task Force that PETA had created a webpage to disparage him and to “recruit correspondents to harass me with emails and letters. The site focused not on my own scientific investigations but on the fact that I work for an institution that conducts animal research.” Over the years, Oregon Health and Science University has repeatedly been accused of maltreating research animals. The USDA has cited it for Animal Welfare Act violations and did so after complaints by People for the Ethical Treatment of Animals in 2008. USDA inspections following more PETA allegations in 2010, however, came up clean. But animal advocates generally are not reassured by what many view as a lax system of accreditation and inadequate oversight. According to New England’s Anti-Vivisection Society website, approximately 150 inspectors oversee 12,000 licensed facilities. Animal advocates want greater transparency. The 2009 grand total was 1,131,076 animals, including 146,417 nonhuman primates. 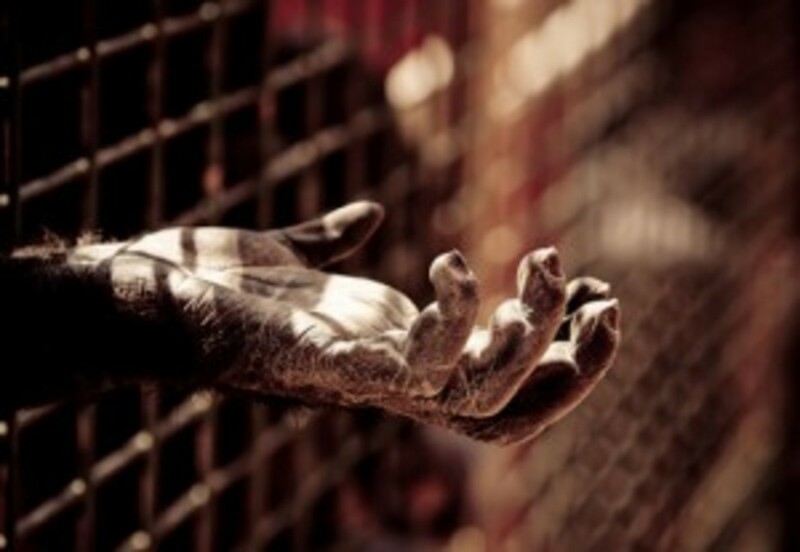 But in February 2011, the USDA amended those numbers to a reduced total of 979,772 animals including 70,444 primates. The difference? The 151,434 animals and 53,941 primates “not yet used,” while still noted within the reports, were again removed from the grand total. David Sacks, the USDA/APHIS public affairs officer, explained via email that including them was a mistake now corrected. The biomedical research community’s response to criticism is commonly to say that laboratories are strictly regulated. But with oversight limited, to a large extent, facilities must police themselves. The NIH calls each facility’s Institutional Animal Care and Use Committee (IACUC) “the cornerstone” to its plan to ensure “the highest standards for animal use.” These review bodies oversee all research and are mandatory in institutions receiving federal research dollars. But they are loaded with researchers. Small facilities’ committees have at least five members and must include a veterinarian and one “public member” with no ties to the facility. Animal protection laws fall far short for animal welfare activists’ liking anyway. The law, for example, doesn’t forbid any experiment, albeit painful or unnecessary or frivolous-sounding. And painkillers are not given for all procedures. Also, even when viable alternatives to animals are available, the law doesn’t require that they’re used, only that they be considered, with reasons for not using them documented. Matt Rossell, campaigns director of Animal Defenders International, was a “psychological well-being” primate technician at Oregon Health and Science University from 1998 to 2000. Experienced in working with depressed or agitated self-injuring monkeys, he asks: “How can you get good data from a monkey that’s so stressed out?” Rossell began secretly filming their condition and living conditions at OHSU before leaving his job. U.S. law and U.S. agencies are both looking at ways to reduce the use of animals in labs.